Mavis Staples is one of the most iconic figures in contemporary music. As a member of the Rock and Roll Hall of Fame, the lead vocalist for the phenomenally successful gospel/soul group the Staple Singers, a friend of Dr. Martin Luther King Jr., and one of the principal voices of the civil rights movement, she has every right to sit back and rest on her considerable achievements. 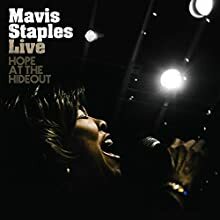 The fact that at 69 Staples can put out an album as luminously soulful and powerful as Live: Hope at the Hideout (Anti) is not merely impressive; it's almost miraculous. The album captures Staples in a live setting before a small but appreciative audience. She alternates between old spirituals ("Eyes on the Prize," "Wade in the Water," "This Little Light of Mine") and songs closely associated with the civil rights era ("Freedom Highway," "Down in Mississippi," "We Shall Not Be Moved"). But she obliterates the sacred/secular dichotomy with every note, imbuing the classic spirituals with a fervor that suggests that freedom in Christ is an ongoing, pitched battle where souls are held in the balance, and that hard-won civil rights are the logical outcome of a Savior dying for Jew and Greek, slave and free, male and female, and yes, black and white. These are all gospel songs for Mavis, and the wonder is that she elevates them to levels that transcend politics and race and transforms them into something universal.